This study evaluated phases of adventure experiences by identifying flow and reversal theory states over a 3-day white-water river surfing course. Data were collected with novice river surfers (n = 5) via in-depth qualitative interviews using head-mounted video cameras. Findings suggested that "opposing" experiential phases (i.e., telic and paratelic) may be symbiotic in adventure experiences and may facilitate flow experiences. 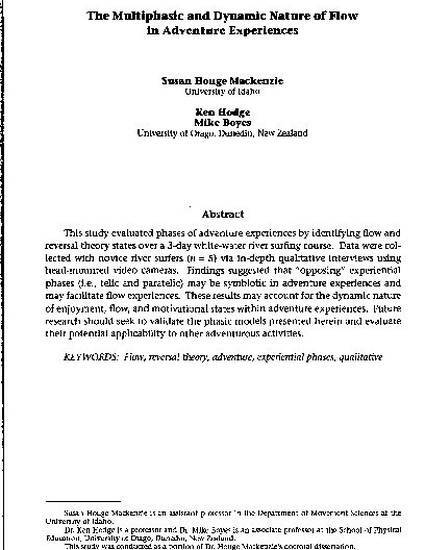 These results may account for the dynamic nature of enjoyment, flow, and motivational states within adventure experiences. Future research should seek to validate the phasic models presented herein and evaluate their potential applicability to other adventurous activities.